What follows is a general description of my own experience of having 'mild' psoriasis for about 30 years (p.s. I am not a medical doctor so these notes are simply my observations and not to be taken as medical advice. I hope they may be of use to people with psoriasis). Included are some things I have found to relieve the condition including: reducing intake of dairy products, wheat and yeast products. Like a lot of people I first developed psoriasis around puberty. It started on my head moved down to my trunk and then ended up on both. Many people have psoriasis on the feet and elbows but I have not (so far) had these problems. Like most people who have psoriasis I simply learnt to live with it. I can't say that it was really very hard or problematic but it did mean I tended to stay away from swimming baths, house hold baths etc. In the first few years I used a coconut-coal tar treatment for the scalp which was left on overnight and washed off in the morning. This seemed to help but needed to be done every few days to keep it under control. As is the case with most psoriasis sufferers the condition deteriorates during stress, illness or tiredness etc. Over time I found the easiest and practical treatment was Tea Tree shampoo  for the head and E45 cream  for the body. During the years I found trying to live to a regular routine helps keep things under control. Meditation, regular sleep, and reduction in alcohol (which also leads to tiredness) help. UV from sunlight helps to reduce the psoriasis in the summer and sometimes even completely clears it for a couple of months. It seems that a few days of good sunshine on say the face and arms can reduce the psoriasis even on the unexposed parts of the skin. In 1990 I went into hospital for 3 weeks for UV treatment. This cleared the psoriasis for about 3 months (till I got my first cold in autumn when it basically returned). I believe the hospital tested for milk (lactose) and wheat (gluten) intolerance but I do not remember any results suggesting I cut these things out of my diet. 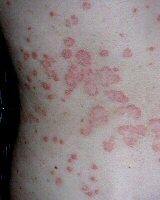 From the late 1980's to 2010's a period of almost 30 years the psoriasis remained basically the same. It improved in the summer when I could get into the sunshine. Some people find that citrus fruits (including vitamin C) make psoriasis worse and I have found this to be true to a degree. I think it depends on what else you are eating. If I haven't eaten for a while and just have an orange without anything else I can often feel a reaction in my skin (a sort of irritation, greater sensitivity etc). Many people claim there is link to a form of mild arthritis and psoriasis and I do often have joint pains in my hand and feet joints. Stimulants such a strong coffee and or just tiredness make it worse. However I am not sure if I have seen a worsening of this with worsening psoriasis. Replacing milk with Soya (soy in the USA) in cereals, tea and coffee certainly helped to reduce the redness and extent of the psoriasis but it didn't seem to reduce it all together. I find that creamy things like trifle are lovely to taste but not 'lovely' for my skin. In 2009 I started to take regular photos of my trunk (i.e. the region between the navel and up to the neck) as I wanted to see how the redness, extent and pattern of the patches changed with the season, month and day. I made up a simple wooden camera holder support that allows me to photo the same region of the body at the same distance etc. so that all the photos could be easily compared. I now have twice monthly photos of the same region of my body running from August 2009 to the present. On the whole my psoriasis is worse in winter than in summer. Some people are the other way around. As I said above the sunshine helps me a lot and even parts that are not directly in the sun seem to improve if I can get as much of me in the sun and get a slight tan. In winter my typical trunk patches are similar to that shown in the first (left hand) photo below, while in the summer it improves and may typically be like that shown in the second photo. From about 2000 I have often had night sweats. Sweats seem to happen four or five hours after eating an evening meal (between 1am and 4 am depending when I had eaten). Sometimes it was so bad I would have to change T-shirt in the middle of the night. I went to the doctor over a five year period but blood tests etc. all came out ok - the was nothing obviously 'wrong' with me. As there was no obvious medical condition I thought perhaps that I might just be taking in too much salt in my diet and that my body was just trying to rid of it. I am a bread fan and so I do eat a lot of salty foods including the bread, butter, marmite (yeast) etc. In April 2010 I cut out bread from my diet (actually cut down my intake*). About the same time I started taking the Wellman vitamin supplement (which includes zinc and also Ginseng). Almost immediately the night sweats stopped and I was also less drowsy in the daytime. However within two months I also noticed that my trunk psoriasis had reduced considerably and the great majority of the rest of the psoriasis had gone too. Even during periods of hard work (tiredness) and a little stress it not come back or deteriorate. Writing this in April 2011 it has so far not returned to its 'normal' level. Joint pain has also seemed to have reduced. I am not sure how much the Wellman vitamins are contributing in all this, I can only say that in a subjective way I do seem to feel they provide some benefit. First picture (far left) shows my trunk psoriasis patches typical of winter time and generaly the same over last 30 years. Next four photos are each month from April 2010 to July 2010. In April I cut-out wheat and started taking supplements (Wellman). Note: April 2010 started off slightly better than usual because I had a week in the Eqyption sunshine but cutting out the wheat has ment that it never went back to the 30 year 'average'. Note: I have slightly increased the red so that the patches stand out better. Left to right: first four photos shows my monthly psoriasis patches from August 2010 to November 2010 while the last photo on the right is six months later in April 2011. A few psoriasis patches have remained but overall they are considerably less red, less soar and smaller in extent since reducing bread in-take and taking supplements. Cut down*: dairy products, salt intake, bread (wheat / gluten?) and yeast products. Although multivitamins are generally 'a good idea' I haven't found them particularly helpful for psoriasis. However Wellman supplements include zinc and ginseng and I do feel they help (see what you find). Finally get in the sun when you can and learn a relaxation technique or better learn to meditate . (* I dont think you actually have to cut out anything completely, I feel you just need to cut down to below a threshold which is upsetting your body). Tea Tree shampoo, Paul Mitchell systems. Not available from UK shops but can be brought directly from UK hair salons. E45 moisturising cream (the thinner lotion is very good).